By Sean Jones: Abel Sanchez says Gennady Golovkin has his mind made up about wanting a 50-50 equal purse split for his fight against Saul Canelo Alvarez on September 15, and he’s not going to be pressured to change his mind by the likes of Golden Boy or WBC president Mauricio Sulaiman. If the “prima donna” Canelo doesn’t like it, he knows what they can do with it, says Sanchez. Sanchez states that it’s up to Canelo whether he wants to take the fight with Golovkin. If Canelo does take the fight, then he’ll need to agree to the 50-50 split that GGG is asking for or else he can move along. Sanchez says that Golovkin sees boxing as a sport, and that’s already financially set. GGG feels that he deserves an even 50-50 split with Canelo after what he’s gone through with him testing positive for clenbuterol and then pulling out of their May 5th fight on three weeks’ notice. If Golovkin sticks to his guns and refuses to compromise on the 50% purse split for the Canelo rematch, then it’s going to put a lot of pressure on Golden Boy Promotions to grant his wish, because if they don’t, they’re doing to be stuck making much less against the likes of Gary O’Sullivan, David Lemieux, Billy Joe Saunders, Jermall Charlo, Sergey Derevyanchenko and Daniel Jacobs. Since Canelo isn’t a true middleweight, he could lose to almost all those guys. The judging can’t hold out forever for Canelo. Sooner or later, Canelo is going to lose a decision and then his days of being a PPV fighter will be gone just like Manny Pacquiao. ”He knows what his priorities are. Gennady said he wants 50-50 or Canelo can go stick it. If he feels that’s what it’s going to take for him to fight Canelo again, then I think it’s his choice,” Sanchez said to Behind The Gloves. Golden Boy is still in negotiations with Golovkin’s promoter Tom Loeffler, but they’re obviously hoping to get them to agree to the 65-35 purse split that they had agreed to months ago for the May 5 fight. As bad as Golden Boy and Loeffler wants to make the fight happen, it’s quite possible that they’ll compromise at a lower figure than the 50-50 split that Golovkin is asking for. Sanchez doesn’t like the way that World Boxing Council president Mauricio Sulaiman is saying that unless Golovkin negotiates the fight with Canelo, he’s going to order him to fight his WBC mandatory Jermall Charlo (27-0, 21 KOs). Sanchez says Sulaiman is using Charlo as a threat to try and force Golovkin to negotiate the fight with Canelo, and he says it’s not going to happen. Golovkin is asking for a 50-50 split, and he’s not worried about giving up his middleweight belts now, because the boxing public now knows him, and he doesn’t need to hold down titles for him to be recognized as one of the best. “It’s nobodies’ business to what Gennady does,” Sanchez said about the WBC president Mauricio Sulaiman wanting Golovkin to take the fight with Canelo, and saying that if he doesn’t take it, he’ll order him to face Jermall Charlo next. “If Gennady decides this is what he wants [50-50 purse split] and how he wants it, that’s Gennady’s prerogative. I think for the WBC to come out and say that, they’re threatening Golovkin, ‘If you don’t take that fight, we’re going to force this guy on you’. I think that’s kind of ignorant. I like Mauricio Sulaiman a lot, but he’s the WBC president and not the match-maker. Gennady is going to fight whoever he wants. Gennady will make a decision based on what he wants to do, not what the WBC is telling him what to do, and not what the IBF is telling him what to do. If he decides he doesn’t want to fight for a particular belt, then the belt can go,” Sanchez said. I think it’s clear that if Sulaiman and the WBC pushes GGG to fight Charlo next, then he’ll vacate their title out of principal. I don’t think Golovkin is going to let himself get pushed around by anyone. At this point, it’s not the titles. It’s more about Golovkin achieving his legacy, and unquestionably, Golovkin would like to fight Canelo Alvarez in a rematch, but not if it means that he’s going to be pressured into accepting a purse split [65-35] that he feels is completely unfair to him. Golovkin already agreed to a lopsided 70-30 split for his fight against Alvarez last September and wound up fighting to a controversial 12 round draw in a fight that he plainly won in the eyes of most boxing fans. For Golovkin agree to a 65-35 split after everything that he’s gone though, it would be a travesty, and I don’t think he’s going to let that happen for a second. ”You have a fighter that’s been clean forever and done everything that’s been asked of him,” Sanchez said about Triple G. ”You have a fighter that has four belts and has been a champion for 10 years. I believe he deserves respect. I think people know who Gennady is. I think they’re going to watch Golovkin whether he has a brown belt, black belt or a blue belt. He wouldn’t have made the statement about the 50-50 if he didn’t know the repercussions. This is a sport to him. He knows the consequences. Let’s go see Canelo make the kind of money has’ going to make against Golovkin somewhere else. It’s impossible,” Sanchez said. At this point the only title Golovkin needs to consider keeping is the WBA title, because with that belt, Golovkin can face WBA ‘regular’ champion Ryota Murata and mandatory challenger Daniel Jacobs. Those are the two biggest fights for Golovkin at middleweight aside from Canelo. Golovkin wants the Canelo fight, but if it means having to agree to a 35 percent split, then that might not be acceptable to him. 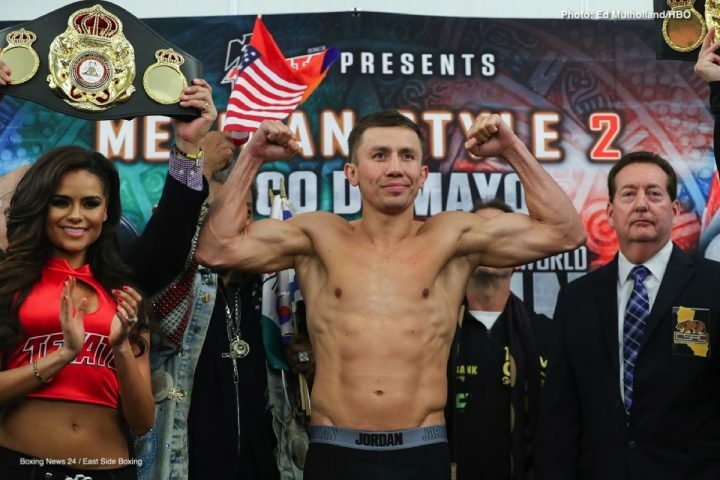 Golovkin, 36, no longer needs the titles for him to continue to win over the fans. The belts are more for just adornment than anything for GGG, but with the politics that are involved in keeping them, it not be worth it for him to keep them. It’s not like Golovkin is going to receive a higher status in the eyes of the boxing public if he wins the last remaining middleweight title not in his possession. When you have as many belts as Golovkin does now, winning one more is not going to make a bid deal with anyone other than the fans that are into stats. In truth, Golovkin might hurt his career more than help it if he goes after the WBO middleweight title held by Saunders, because it’s not a fight that will interest people in America. It’ll also be an ugly fight to watch because of Saunders’ movement. “I think that fights impossible,” Sanchez said about a fight between GGG and Saunders. “I think Billy Joe is too hard to deal with. Thomas [Loeffler] has stated that in the past. I would hope that it would be that, a unification. But if not, I think next week will tell us what Plan-B is. I’m sure Tom is talking with everybody concerned and we’ll know next week. There is a Plan-B and Plan-C obviously. We won’t know that until Oscar comes off his high horse and Canelo realizes it’s the fight that needs to happen and they’re fair to Golovkin,” Sanchez said. Saunders (26-0, 12 KOs) pulled out of his June 23 fight against Martin Murray earlier today, saying that he has an injured hamstring. Loeffler might be able to setup a fight against Saunders now if challenger Canelo continues to price himself out of the fight by wanting too high of a purse split. If Canelo can come in at the nice price of 50-50, then the fight can probably get done. You can imagine that Golden Boy will make sure that Canelo gets the venue that he wishes by having the rematch take place in Las Vegas once again, as well as other perks like having his name first in the promoting of the fight.